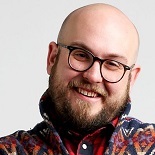 Cypress, Texas born Robert Askins is the author of the Tony-nominated and Obie Award-winning Broadway hit, Hand to God, which enjoyed a run on London’s West End and was nominated for the Olivier Award for Best New Comedy. His comedy Fish Display was part of the 2012 Ojai Playwrights Conference, and his play Permission, also developed at OPC, had its world premiere off-Broadway at MCC Theater in spring 2015. Most recently his play The Squirrels appeared at LaJolla Playhouse. Rob is so excited to return to the Alley after developing the Carpenter at 'Alley All New'. Rob is the recipient of two EST/Sloan grants, the Helen Merrill Emerging Playwrights Award, and an Arch and Bruce Davis Award for Playwriting. Rob is a graduate of Baylor Unversity in Waco Texas.